Abstract—The release of nitrogen and phosphorus from aquaculture ponds to Selangor River, Malaysia was estimated. The concentrations of nitrogen and phosphorus in aquaculture ponds were always higher than those in the river, their primary water source, indicating that the aquaculture ponds are sources of nitrogen and phosphorus in Selangor River. From the careful interview with aquaculture managers, the frequency of water exchange, the number of harvesting, and the amount of feeds added, the total volume of water released to the Selangor River was also obtained. The total amount of nitrogen and phosphorus added to each aquaculture pond was estimated to be about 700 kg N and 60 kg P per year, respectively. About 100-200 kg N and 10-15 kg P were estimated to be released with the waste water per pond per year, accounting for 20-30% of nitrogen and phosphorus in added feeds. It is important for us to precisely estimate the fates of nutrients for the better management and sustainable development of aquaculture industries. Our data may help to improve aquaculture management in future. Index Terms—Rivers, aquaculture, nutrient release, eutrophication. Nobuyuki Kawasaki and M. R. M. Kushairi are with Universiti Selangor, Malaysia (e-mail: kawasaki@unisel.edu.my, kushairi@gmail.com). Fatimah Yusoff and Norio Nagao are with Universiti Putra Malaysia, Malaysia (e-mail: fatimahyus@gmail.com, monodonmonoceros@yahoo.co.jp). Akio Imai and Ayato Kohzu are with National Institute for Environmental Studies, Japan (e-mail: aimai@nies.go.jp, kohzu@nies.go.jp). 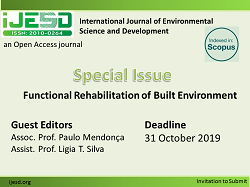 Cite: Nobuyuki Kawasaki, M. R. M. Kushairi, Norio Nagao, Fatimah Yusoff, Akio Imai, and Ayato Kohzu, "Release of Nitrogen and Phosphorus from Aquaculture Farms to Selangor River, Malaysia," International Journal of Environmental Science and Development vol. 7, no. 2, pp. 113-116, 2016.